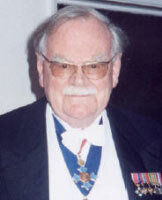 In 1952 Alexander Shafto Douglas (21 May 1921 – 29 April 2010), known as "Sandy", a graduate student in Cambridge, was writing his Ph.D. thesis on human-computer interaction for the University of Cambridge. 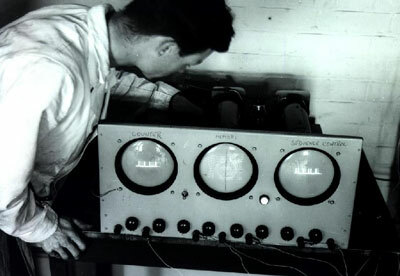 He decided as part of his thesis to create a computer game on the EDSAC computer at University (one of the first stored-program computers in the world), thus creating the first graphical computer game OXO (also known as Noughts and Crosses, an old non-computer game that people can play with pen and paper). Electronic Delay Storage Automatic Calculator (EDSAC) was an early (1949) vacuum tubes (it contained 3000 tubes) based British computer, operating 600 instructions per second. It used 32 mercury delay lines (or long tanks) each of which stored 32 words of 18 bits. Hence the total memory capacity of the EDSAC was the equivalent of about 2 kilobytes. A useful feature of this serial memory technology was that it was possible to display the contents of the store on Cathode Ray Tube (CRT) monitors. Each tank stored 16 words of 35 bits. EDSAC used 3 CRTs, one of which displayed the contents of one of the long tanks (see the nearby image). Thus, the display was a matrix of 35 x 16 dots. The input of EDSAC was via five-hole punched tape (thus the actual program for the OXO game was punched on a strip of paper ) and output was via a teleprinter or CRT. 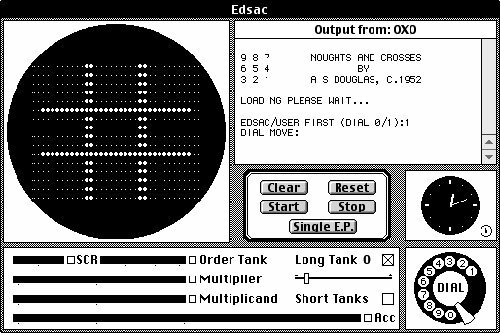 To play the OXO game (see the OXO game simulator below), the player would enter input (where he wanted to place his nought or cross) using a rotary telephone controller, and output was displayed on the computer's dot matrix cathode ray tube. Each game was played against an artificially intelligent opponent (EDSAC) and the player determined who played first (EDSAC or USER). Alexander Douglas' thesis was a success, earning him his Ph.D. and starting his career in science, however he would never again program another video or computer game.